The candle is a very influential symbol in our conscious mind. It may represent the light in a world that would otherwise be dark; it speaks to the deepest part of our soul. For this reason the candles has such a profound significance in so many cultures throughout the world. It can be found in the ceremonies of just about every religion. Judaism: The candle is a dominant symbol in Judaism; one is lit every Friday night to celebrate the beginning of the Sabbath. On Saturday evening, a Havdalah candle is lit to mark the end of the Sabbath. Candles are also used in the Chanukah ceremony, where a candle is lit each evening for eight nights, to celebrate the candle which miraculously burned for eight days, when the Jews regained their temple from the Greek / Persian Invaders. For the Jewish people, the candles flame symbolizes the eternal burning flame of the divine being. In Judaism a candle is also used to memorialize those who have passed away, and they are often lit to memorialize a loved one, or those who died tragically, such as those of the holocaust. Christianity: In Christianity the candle is used for religious and decorative purposes. In its decorative function, it is a symbol of the Creators light, the light of Jesus. For this reason you will regularly find a candle lit and positioned on the altar. 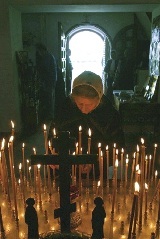 Ritually, candles are frequently lit and located in front of pictures or icons in the orthodox tradition. A votive candle may also be lit to go with a prayer. Some churches also use a Paschal candle which represents Jesus, and only lit on Easter and other extraordinary occasions. Buddhism: In Buddhism, candles are frequently positioned in front of a statue of Buddah along with food or drink as a symbol of reverence. Symbolically they represent the light of Buddah’s teaching and the enlightenment of the world. 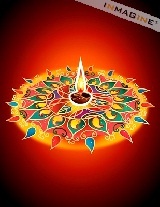 Hinduism: the Hindu tradition a diya, or clay lamp, is a very significant part of every religious ritual. The lamp holds a candle during the ceremony, and acts as a symbol of prosperity and enlightenment. Every year they also celebrate Diwalli known as the festival of light. On this festival lamps are lit to symbolize life and hope for the conquest of good over evil. New Age Religion: New age religion also referred to as Metaphysics use candles to perform what is called candle magic, this is one of the simplest forms of spells. It’s a simple ritual that does not require a lot of materials. Anyone with a candle can perform this ritual. In this type of ritual the type of candle and the color are very important. First the candle must be new. Second it should be a short taper candle or a votive candle and must not be scented. Lastly the color should represent what you are working for. The following is a list of candle colors and what they represent. The spell would be written on a piece of paper of the same color as the candle. Fold the paper, concentrating on what you are working for. Chant your incantation and light the corner of the folded paper and allow to burn completely. Allow the candle to burn completely. If you must extinguish the candle before it has burned completely snuff it out with a candle snuffer never blow the candle out. The symbolic meaning of a candle and the importance it gives in many of the world’s religions. Whether it symbolizes the Supreme Being, or the hope for the enlightenment of mankind, the flicker of its light is an inspiration to many who witness its light. In concussion the question is would lighting a candle and saying a prayer before going to bed improve our chances of receiving revelation in our dreams. Would concentrating on that tiny flame while we meditate help to improve the enlightenment of our mind during our dreams. It may not make you the next jackpot winner or make a movie star fall madly in love with you, but it might provide the enlightenment trough our dreams that would allow you to obtain the things you need and help you to live a more productive life. This is a very cool article, I could not have agreed more. I just read this. It’s good to see websites with your content starting to now appear. I think as we move more into a new age, spirituality and topics discussing this sort of stuff will become more and more widespread and important. Human knowledge will be heightened and humanity will be taken to the next level of awakening. Another very interesting article I read was on the following website crystal children, something i think you guys will like! I have bookmarked your website, be back soon! I would like to say thanks for the time you took compiling this article. This has been enlightening for me. I’ve forwarded this to one of my friends. LOVE your blog. Keep up the good work .